Menulog delivers for Phuket Coconut Thai Restaurant so you'll be able to track your courier on a map. 4 x Spring Rolls or Curry Puffs, Red Curry with Chicken, 1 x Large Steamed Jasmine Rice and 1 x Can of Soft Drink. 4 x Spring Rolls or Curry Puffs, Chicken Cashew Nuts, Green Curry with Chicken or Beef, 1 x Large Steamed Jasmine Rice and 2 x Can of Soft Drinks. 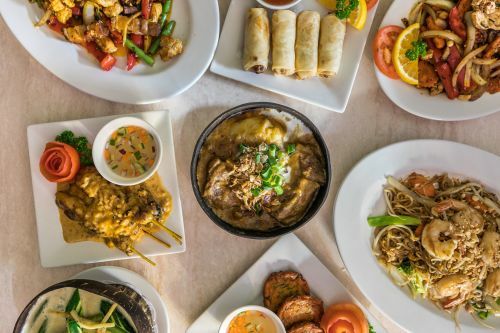 4 x Spring Rolls, 4 x Satay Chicken Sticks, Chicken Cashew Nuts, Green Curry with Chicken or Beef, Stir-Fried Prawns with Oyster Sauce, 2 x Large Steamed Jasmine Rice and 1 x 1.25L Drink. Egg pastry filled with minced pork served with homemade sauce. Crispy spring rolls with mixed vegetables. Crispy spring rolls with minced chicken and vegetables. Deep fried pastry filled with chicken and potatoes. Deep fried pork minced marinated with cashew nut sauce served with sweet chilli mixed with mayonnaise. Deep fried tofu served with steamed vegetables and topped with peanut sauce. A soft bun filled with satay chicken and mixed vegetables. Marinated chicken skewered and grilled served with peanut sauce. Marinated rum steak slice skewered and grilled served with peanut sauce. Crispy golden parcels filled with minced chicken and water chestnuts. Deep fried fish cakes served with cucumber sauce. Thai marinated pork skewered and grilled served with North Eastern Thai style sauce. Deep fried calamari tentacles served with sweet chilli sauce. Deep fried calamari rings served with sweet chilli sauce. Deep fried prawns coated in coconut served with sweet chilli sauce. Thai style deep fried crumbed chicken breast topped with special lemon mayonnaise sauce. Thai style marinated chicken breast served with steamed vegetables and sweet chilli sauce. Thai style deep fried crumbed chicken breast topped with special creamy Southern Phuket curry sauce. The marinated chicken stir-fried with special cashew sauce, celery, onion, capsicum, carrot and cashew nut. Premium beef rump stir-fried with garlic, mixed vegetables, green curry paste and special seasoning sauce. Roast pork stir-fried with garlic, mixed vegetables, green curry paste and special seasoning sauce. Lightly battered prawn cutlets served with mixed vegetables, topped with Phuket traditional sauce and tamarind sauce. Lightly battered prawn, topped with Thai chu chee curry served with mixed vegetables. Lightly battered fish fillets, topped with Thai chu chee curry served with mixed vegetables. Steamed barramundi fillet topped with lemon and Thai style sauce served with steamed vegetables. Stir-fried with crispy soft shell crabs served with mixed vegetables and special garlic and pepper sauce. Stir-fried soft shell crabs in curry powder served with carrots, eggs, onions, capsicums, shallots and celeries. Stir-fried combination seafood (prawns, scallops, calamari, mussels and baby octopus) with Thai sweet chilli paste, tamarind sauce, onions, capsicum and baby corns. Grilled salmon topped with Panang curry and steamed vegetables served with steamed rice. Chunky tender lamb cooked in traditional Massaman curry paste, coconut milk, peanuts and potatoes. Battered fish fillets, deep-fried and topped with a special three-flavour combination and tamarind sauce. Deboned roast duck served with sweet chilli sauce. Thai green curry cooked in coconut milk with bamboo shoots, beans, zucchini and basils. Thai red curry cooked in coconut milk with bamboo shoots, zucchini, beans, capsicums and basils. Thai Panang curry paste cooked in coconut cream and sliced lime leaves. Mild turmeric powder curry in coconut milk with potatoes and onions. Chunky tender beef or sliced chicken cooked in traditional Massaman curry paste, coconut milk, peanuts and potatoes. Stir-fried with Prik Khing curry paste, bamboo shoots, beans, capsicums, onions and fresh basils. Stir-fried with garlic and pepper served with steamed vegetables. Stir-fried with aromatic ginger, onions, broccoli, zucchini, mushrooms and baby corns. Stir-fried with carrots, capsicums, onions, shallots, cashew nuts and special Thai style sauce. Stir-fried with Thai style sweet and sour sauce, pineapples, tomatoes, cucumbers, onions and baby corns. Choice of deep fried or steamed chicken served with mixed vegetables and topped with peanut sauce. Stir-fried with bamboo shoots, beans, capsicums, onions, fresh chillies and basils. Stir-fried with mixed vegetables, potatoes and onions in creamy coconut sauce. Stir-fried with onions, broccoli, zucchini, mushrooms, baby corns and oyster sauce. Stir-fried with mixed vegetables and satay sauce. Stir-fried thin rice noodles with mixed vegetables and eggs sprinkled with peanuts. Stir-fried flat rice noodle and mixed vegetables with sweet soy sauce. Stir-fried flat noodle and vegetables with chillies and basils. Stir-fried Hokkien noodle and green vegetables with oyster sauce and sweet soy sauce. Thai style fried rice with eggs and mixed vegetables. Thai style fried rice with pineapples, cashew nuts, eggs, red onions and peas. Special fried rice with onions, carrots, peas and sausages served with deep fried chicken. Tangy hot and sour clear soup with straw mushrooms, onions, lemongrass and chillies. Thai coconut milk with lime juice, galangal, lemongrass, straw mushrooms and coriander. Thai clear soup with mixed vegetables and mushroom. Minced chicken mixed with cucumbers, red onions, shallots, tomatoes, coriander and fresh herbs seasoned with spicy dressing. Thai spicy salad with special sliced grilled beef, chilli powders, cucumbers, onions, tomatoes, lime juice and fresh herbs. Deep fried or steamed combination seafood seasoned with chilli powders, cucumbers, onions, tomatoes, lime juice, fresh herbs and spicy dressing. Traditional Thai salad of shredded green papaya, fresh chilli, garlic, tomato, green bean, fresh lime and palm sugar mixed with steamed prawn. Topped with Jasmine syrup and icing. Served with a chocolate topping. Served with sticky rice (Thai style dessert).